Zoologist and conservationist Ian McTaggart-Cowan, who died in 2010, has been called the father of Canadian ecology. The publication last year of two books on his life and works — The Real Thing and Ian McTaggart-Cowan — and Jennifer Bonnell’s recent review and post related to those books, got me thinking of my own brush with the man in 2003. Ian McTaggart-Cowan. Source: University of Victoria. I learned that McTaggart-Cowan was 92, living in Victoria, BC, and, as they say, still chipper. I tracked him down and called him up. He was indeed chipper, with a clear voice and a clear mind. I asked if we could arrange an hour or two for an interview. He refused. He was much too busy for the next few months, and everything he had to say about Banff and Jasper in the early ‘40s could be said in five minutes, so why don’t we talk right now? I refused. I’ve done enough oral interviewing to know that if you’re given five minutes, that’s how much information you get. But if you have longer, you get much more. McTaggart-Cowan was a little bemused that I was willing – insistent, even – to postpone an interview with a 92-year-old, but he offered me a time two months later. Two months later, I called him, and we had the following chat. The audiotape of the interview is of highly variable quality, but I will eventually clean it up and have it accompany this post. As you’ll see, McTaggart-Cowan regretted not having maps of Banff and Jasper with him when we spoke (and I regretted not sending them to him), which is perhaps why he focused more on overall impressions than a narrative description of his fieldwork. Fortunately, the University of Victoria library system has put his Field Journals online, fully transcribed and word searchable. His 1943-44 field notes are here and here, and his 1930 field notes are here. All right then, here we go. … I want to talk to you specifically about your work in Banff and Jasper National Park in the 1940s. What was your career like at that time? I was first at Banff in 1930 as a student at the university. And then I came back in ’43. By that time I was on the faculty at the UBC. That’s where I had my career, until I retired in 1976. When you went there in 1930, you weren’t just visiting, you were doing research there as well? Yes, I was with Hamilton M. Laing, who was the first park naturalist hired at the hotel in Jasper. Originally, I started out with him south of Fernie in the tobacco plains on the east Kootenais of BC. He had been working on a series of expeditions over a period of 5 or 6 years, all the way across the province’s southern boundary with the state of Washington. I was with him on the last part, finishing up in the Rocky Mountains. We were supposed to be there all summer, but at the end of May he got a telephone call from Ottawa asking him to report immediately to Banff, where he was to be the first park naturalist. So I got the task of packing down our camp, packed it all, put his wife in the other seat, and driving him to Banff, which was quite the experience. 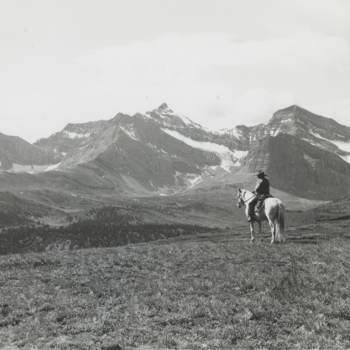 Actually, we drove to Jasper, he was attached to Jasper, so I didn’t get to Banff until later in the summer of ’31 [‘30]. I was doing field collecting that summer, mostly in Jasper. Mammals. My employer was RM Anderson, the director of the National Museum of Canada and also the head mammologist there. Primarily mammals. A few birds. So by ‘43 you had a good reputation at UBC, that’s why Parks Canada contacted you in ’43? Now, when they asked you to come in in ’43, were you your own boss, or were you working for a superintendent there? Jimmy Simpson on Mount Southesk, Jasper. Source: Cowan_PP_251, U Victoria Special Collections. Found in Briony Penn’s The Real Thing (Rocky Mountain Books, 2015). I was my own boss. They were extremely helpful. To start, they hired me a packer and they provided a small boy to run errands. The packer was Jimmy Simpson, of whom there could be no finer tutor. That guy knew the Rocky Mountain parks inside out! His cabin at Lake Louise, at Bow Lake now, that was his headquarters, trapper’s cabin. He and I travelled together – he was the last one to use a tipi in the mountains – and we travelled together for four months. And there was only one other person in camp, and only for a short while, because we found between us we could handle the horses ourselves perfectly well, we travelled by horse. We started south of Banff, up the … oh, boys, I wish I had a map… up to one of the high camps just behind Mount Arrowsmith and across the mountains there. … How stupid; I could remember all this stuff before… Then we came back to Banff and outfitted and went up Forty mile Creek, through Hole in the Wall Mountain, …down the Panther River, over to Ya Ha Tinda Ranch, to the Red Deer River. I had a look around at the summit there, then turned around …the name is gone… and then down to the highway there. And then we drove from there to the southern boundary of Jasper Park – took the horses up by truck. And then we started up and went all the way around the southeastern boundary of Jasper, re-outfitted, and went up the Snake Indian River to its head in the north boundary, and I came out at Mount Robson. So we travelled a lot that summer of ’43. I’d like to hear how you and Jimmy Simpson got along. You said that second morning, when he went and got the horses, and came back and watched what you were doing. He started taking a real interest. Am I right in saying maybe he started trusting you more than he did right at the beginning? I don’t think there was any problem with trust. But he didn’t know. I was a new species. He was taking a good look at me – perfectly properly. You didn’t ask for his assistance? People at Banff set that up themselves? I think so. They had a horse boy. They got him to help me because they really wanted to know something about the big wildlife in the park. There’d not been an inventory up to that point. … The wardens were guessing. What kind of things do you think you taught Simpson, or at least that he hadn’t looked at? Can you give me an example? It’s just the sort of thing that comes up as you go along. He had not been in Jasper Park before – well, he had been in the very southern end of it. So he was fascinated to see Jasper Park. It’s so different than Banff. Everything’s set back, you can see the view, the mountains aren’t crowding in on you, there’s a lot of different wildlife, open country wildlife is more abundant. I much prefer Jasper to Banff. You were saying that the parks were trying to inventory, to find out what they had? They didn’t know what they had? They had an idea, but they didn’t know how many, or where they were and what they were dependent upon. They didn’t know that this was absolutely essential winter range, and so on. There was a lot of information among those wardens, but you had to harness it. Let’s take the wolves, for instance. I found there were wolves in the park, particularly in Jasper, they only got into Banff – well, they got down as far as Lake Minnewanka, the Panther River in Banff. I got interested in the wolves – well, how do you study wolves? You don’t study wolves unless you can identify them individually, and certainly packwise. Well, during the wintertime, all the wolves are in the valley bottoms – the snow’s too deep higher up, there’s no animal feed up there. So the wardens are all travelling the river valleys, so they’re going to see the wolves, or if they don’t see them they can find them quickly. So I made an arrangement with the park wardens, whenever they were aware that a pack of wolves were moving through their area, to get a look at it, and to count the number of blacks and the number of greys – you could describe it, “This pack has five animals, three of them are black, one is almost white, or brown.” So every pack had a different mix of colours. Then they’d pass that word down the line by telephone. “Pack A with five animals is coming your way. When you see it, pass it on to the next man.” In the course of two or three winters, we added a lot of information on the wolves. We knew what their ranges were, we knew how many there were, we knew if they had young or not. I wrote a paper on it; it’s published. Why weren’t the wardens organized, bringing together that information? That wasn’t part of their job! They were to keep out the poachers and make sure the animals were protected. That’s interesting. I remember you recommended against the killing of predators. What did they think of that? They were a bit puzzled. They thought they were there to protect animals, and one way to protect animals was to kill the wolves and the mountain lions. One thing they had trouble with was the grizzlies. There were some of the park wardens just never did stop shooting grizzlies. They were afraid of them. And that’s reasonable. But they had a man up at the Medicine Lake cabin, and he shot a grizzly every time he saw one. But there was a lot of grizzlies in there. Scared of them! The trails were padded down – I’m not exaggerating – with grizzly tracks. The other man doing a lot of that was up Yellowhead cabin in Jasper. It wasn’t good, you can turn them in, but if you start turning in the wardens, your source of information’s gone, so you don’t. You take an objective view of what’s going on, and you follow from there. 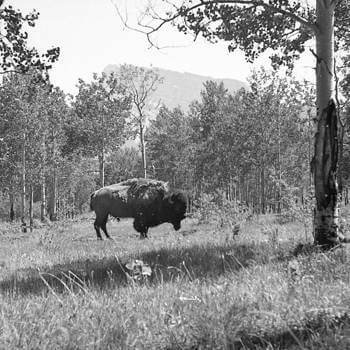 American Bison, Banff 1944. Source: Cowan_PH_021, U Victoria Special Collections. Found in Briony Penn’s The Real Thing(Rocky Mountain Books, 2015). These ones who would be shooting grizzlies, they wouldn’t be telling the Superintendents? Wouldn’t be telling anybody. Well, they’d tell me. I’d find out, and as soon as they’d trust you, they’d tell you anything. I knew when there was a warden at Saskatchewan Crossing in Banff, picked up a fellow in Lake Louise, brought him into his territory, delivered him over the ridge, away from the hill with a horse, the fellow went up to … oh, I had the name … there was a cabin at the edge of the park, and he spent from October to December there, and then he got sick. I heard about it – the park didn’t know about it. When I got into the park that summer, I asked the Superintendent to provide me with two wardens, who I named, because I wanted to go in to see this area, and he said, sure. One of the wardens was named Young – I don’t remember the other. As soon as we left the main valley, I started to find sweet scents along the side of the trail – which is a notch taken out of a tree trunk, a pole leading up to the notch, put the bait in the back of the notch, and you set a #1 steel trap at the end of the pole. It’s a real marten getter. And marten is what they were after, they were very expensive, you could get $100 for a good pelt. So I saw about 40 of these as we rode along this trail. We got to just where the glacier came out, from Castlegar, and I said, “I want to go over here, I want to go to the lake.” “No, you can’t cross that river, you can hear the boulders rolling in it.” “Well, you can follow me.” So I went over, we got to the camp, and I got off the horse. What trappers do, they take the animal inside, they thaw it, they skin it, then they come to the door and throw the carcass. So if you go a short distance from the back door of the cabin, you’re going to find all the carcasses. So in a few minutes I had 20 or 30 carcasses, grizzly bear skulls. Lined them all up. The warden was shaking and I said, “Well, how about it?” Went into the cabin, I knew the guy had come out sick, and found some bottles of medicine. I found some trousers, and I reconstructed this guy’s height … but I knew it all already, because my informant was Jimmy Simpson! Jimmy knew who’d been there. So they weren’t just trapping themselves, they were bringing someone in to do it for them? A friend of theirs! Jimmy Hatter, later the chief game officer of BC, lives a couple blocks from me, he’s still here. He was with me, as a student, when we got out, got down to where the river joins the main Avalanche River, and I said, “If you were coming down here sick” – we knew all the traps had all been lifted up, there wasn’t any still on the trees – “where would you hide them?” “Well, I guess I’d put them over in that clump of trees over there.” So we went over to the clump of trees, and picked up 80 traps. I brought them into camp, threw them on the ground in front of this warden, said, “Well, how about it, fella?” That’s all I said, and about the time we got near the highway, the guy says, “What are you going to do?” “What do you think I’m going to do? I’m going to turn you in.” Well, he got drunk that night, and broke into the warden’s toolshed, and he was fired. So I didn’t have to turn him in. They must have been worried about you. You must have been on their turf. Do you think it was only a couple of the wardens who were trapping? Oh yes. Most of them weren’t. No, I got no indication at all that anybody else was. Den of Gray Wolf, Jasper 1945. Source: Cowan_PH_125, U Victoria Special Collections. Found in Briony Penn’s The Real Thing (Rocky Mountain Books, 2015). I know in Ottawa, in the late ’20s and ’30s, they were concerned a lot was going on. There may have been. 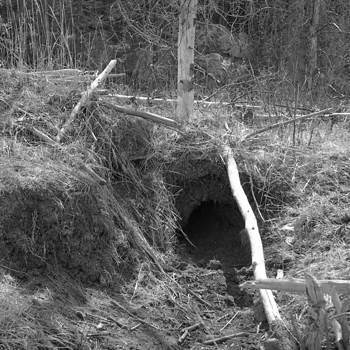 One of the wardens dug out a wolf den down on the Panther River. It was a damn fool thing to do. They killed two of the pups, but one of them was a better digger than they were, they couldn’t catch him. They took one, and drove it back to Banff. When I got back there, they were really annoyed, because I took it upon myself to seize that pup. I told the chief warden what they’d been up to, and he was very upset. I carried that little beggar back in my packsack all the way back to where his den was, an eight mile walk, I guess. Now that den had been there, I bet, for centuries and I’d be very surprised if it was not still used. It’s there right in the floor of the valley, down in a clump of spruce, the whole place was honeycombed with the burrows. And I let the little guy go, hoping that I knew his fate there was at least as good as it was in town, and on my way home up the river I saw the she-wolf with the other cub, so I knew he’d be all right, and he was. I had put a tag in his ear, and he was killed four or five years later down near Sundre by a trapper. [McTaggart-Cowan supported the continuation and even expansion of Banff’s elk slaughter program. In 1946, for example, he recommended that 800 elk be killed. So I asked the following.] I know you weren’t in favour of the killing of predators, but I know one thing that came out of your research is that you were in favour of a managed slaughter of elk. Yes. Well, they wanted big game, and they were losing it because there was no range left. I was young, and there was an awful lot more to be learned in life, and I’ve learned a lot since. I wouldn’t handle it the same way now. It was very much in keeping with the beliefs of the time. Yes, it was. And the fact that they were doing it already. They were shooting elk. The problem that always bothers people is the wasting the stuff. And they took the meat to Indian reserves, and they made good use of it. But if you’re going to do a big slaughter, that’s a lot of animals. You’ve got to slaughter a lot to make it worthwhile? Yes, that’s right. Things changed, there were a few fires. In those days, they fought fire. Now they don’t fight fire, so you’ve got much nearer a natural situation. They’d been fighting fires for years, so there were jack pines growing up, thick as the hair on a dog’s back. So there was no place for the big animals. And the places where they were losing them was where the tourists see them! So that didn’t make too much sense to them. The answer really was, to help the range grow, so that you didn’t have to kill so many. Because killing is not a good thing to be doing in a park if you can avoid it. What were your overall conclusions about the wildlife situation in Jasper and Banff at the time? What was needed – was anything needed? There wasn’t much needed. The elk were the only problem animal. The moose were fine; it’s very difficult to census moose. Elk you can census, bighorn you can census. Deer are difficult. In general I thought the wildlife was in good shape. The beavers were doing extremely well – that can again be a problem. You’ve got all the wet areas in the lower valleys flooded. There’s nothing left but standing dead trees. It didn’t look very nice in the park. The ideals of what you looked for, what you wanted in a national park were still developing. This was quite new stuff. I was finding my way like the rest of them were. Why then? Why was there an increasing interest in science in the parks? Science answered questions, with more certainty than they had before. The parks were getting a lot of badgering by influential sportsmen, particularly there was a fella name of Fisher [W.C. Fisher, President of the Alberta Fish & Game Association and of the Canadian branch of Ducks Unlimited] who was head of a bunch of renegades that were very much against the parks. One of the things he’d said was that he had driven to Banff, from Canmore, and seen four mountain lions on the way in. It was absolute rubbish. He was either lying through his teeth or he didn’t know a mountain lion from a coyote. These things were published in the sportsmen’s journals. Parks were getting a reputation for being predator raisers [? ], and the predators were then spreading out into the gamelands beyond the parks – so it was becoming political. When you were able to give them numbers, were the parks able to use them effectively? Sure. They were all published. Do you think people like Fisher bought into your stats? I went and talked at their meetings. I gave hundreds of lectures all over Alberta, Saskatchewan, BC. One of the things I had my cap set on was getting rid of the bounty system. When I started out, everything in the province of BC had a bounty on it – owls, jays, crows, coyotes, wolves. Why did you want to be rid of the bounty system? First thing is, it’s senseless. It keeps the healthy ones, so they can have more young, by not allowing the normal pressures of numbers. And it wastes money. It’s just a racket. We had the greatest number here in northwest BC of bounties on wolves the year they stopped paying a bounty in Yukon – all the pelts were taken down to BC. … There was a woman in [? ], a government agency, she caught on they were bringing in pelts in the front door in the daytime, collecting the bounty, and they were thrown out, and picking them up again in the evening, and brought back the next morning. Round and round until they were threadbare. Was the research you did in the parks valuable in the global sense? Did this work become theoretically important? Oh yeah, that wolf study I did was the first of the wolf studies. It was the first attempt anywhere on this continent to really come to grips with a wolf population. Murie had done some nice work up in Mount McKinley Park, that’s true – but again it was quite a bit different. His was more behavioral stuff, he was watching them. I know that pack, the two packs that he was studying I put a student on, we got a whole another report on what was going on – same dens. Mine was behavioral in a sense. But there’s behaviors as interactions of individual animals, with each other – that’s one kind of behavior. Behavior of the packs, is another kind of behavior. I was doing behavior of the packs, and interactions with the wildlife of the pack range, and that’s not what Murie was doing. I mean, there was quite a lot that came out of that work; … we showed the role of the wolves in closing a lot of the range to the use of sheep. When there was no wolves there was something like 3600 sheep, but when there wolves there was only about one-tenth of that. Because that was all the range there was, the sheep couldn’t eat it up without being attacked by wolves. It wasn’t so much a question that the wolves were killing the sheep, they were preventing the sheep from using the range they would otherwise be using. That was the sort of thing – this had never been dreamt of. It seems old hat now, but it’s old hat because I published it. Did your research methods improve over the course of that summer? Would you see tourists on your travels? What kind of days would you have, when you were out working with Jimmy Simpson, would you work? Crack of dawn to dark. You’re not punching a clock. And if there were things to be found out after dark, you did those too. I have no idea how far I would travel in a day. If I was working for the Museum of Natural History, I would set a trapline one day, and if you don’t get out by the crack of dawn and get your specimens, the varmints are going to come and eat your specimens. It’s gorgeous. It’s the best time of the day. When I was with Jimmy, he’d fry bacon and eggs, and I’d tell him where I was going – if you want to survive, you tell people where you are. Did you ever get lost? I think that’s all my questions. I gave you my email – do you use email? If it’d be ok, I’d like to pass this on – not the whole tape, just the mention of it – to a friend at Parks Canada. It seems to me, they’d be crazy not to talk to you about your memories of Banff and Jasper. I haven’t talked to anyone in the parks since 1944. [laughs] Just the way it turned out. I tried, on the centennial [in 1985], I said, “It’d be great fun to go back and visit the major sheep ranges that were occupied when I was there, and make the same counts, done by the same persons, in the same areas. It’d be a pure accident if you hit a major change in population, but it’d be interesting.” And they said, “Oh, all our money is assigned to other projects.” More fool them. They’re not going to get someone else who did it, say, 50 yrs ago. Want to go with me and do it this summer? Thanks for putting up with me today. Wow, thanks for sharing this Alan! 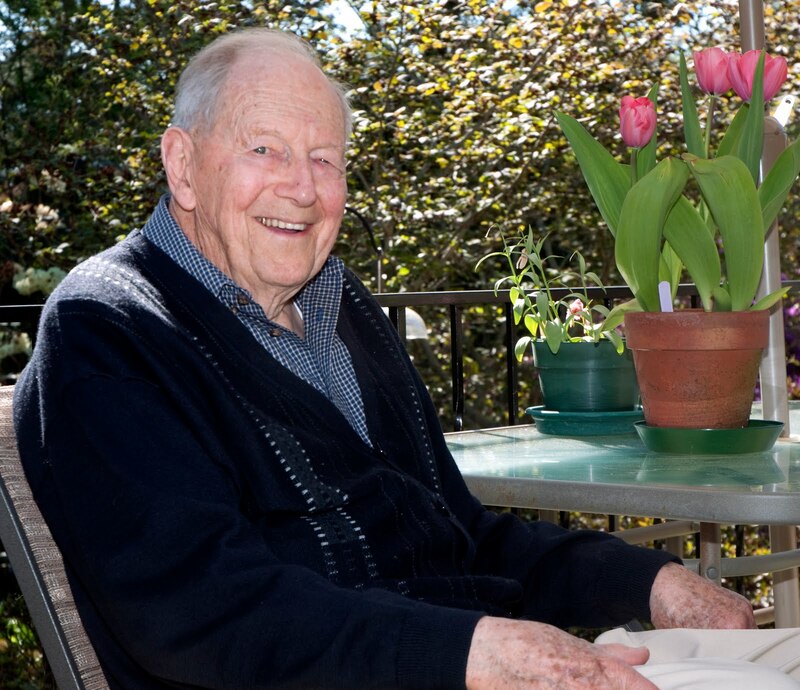 There are many other retirees in Victoria with similarly important stories to tell about parks in western Canada — planners who started working for the BC Parks Branch in the late 1940s, for example. What a great interview! Thanks for posting this, Alan. A nice illustration of the sometimes wonderfulness of oral history. It reminded me of interviews I did with British ecologists of a similar age as M-C (contemporaries of Arthur Tansley) back when I was doing my dissertation. Just discovered this now, Alan. A great read! And even after reviewing both the Penn and Jakimchuk biographies on Cowan, I get a better sense of the man reading these transcripts. I like the idea of using the web to share “curated” transcripts as introductions to larger bodies of research.